27" x 1 1/4 Tires? I am trying to find a 27" tire that will work well for commuting/touring on my 1985 Schwinn Voyageur SP. The best ones I can find are the Schwalbe Marathon's. I just got my second flat last night in as many weeks. Does anybody else have any ideas/recommendations that might top the Marathon's? I would really like the Marathon XR's but Schwalbe doesn't make them in 27". What's causing your flats? I've used Continental Ultra Gatorskins for a long time and the only thing that I've had puncture them are little bits of wire from blown out steel belted tires. That said I'm going to try Serfas Secas when I have to replace the tires that came on my 27" Centurion. Thanks for the quick replies! The first flat I got was from broken glass, the second was from a thorn. I have read good things about the Conti Ultra Gatorskins. Which would you guys recommend the Gatorskins or the Marathons? It looks like a tossup. Also, it's too bad that there are no fatter tires made in 27". I wouldn't recommend the Serfas Secas. That is what I have on this bike right now and replacing. They are horrible as you can see with the 2 flats so far. Specialized Armadillos. While riding once I heard this ticking noise coming from my real wheel. I pulled over and it was part of a finishing nail that was embedded in the tire, but was at a very low angle and was hitting the brake assembly everytime it came around. I pulled the nail out with pliers when I got home. It never pierced the tube. The nail appeared to go at 90 degrees, but when it hit the kevlar belt was turned to a more shallow angle. That's pretty tough. The Marathon's are about the best, but the Pasela Tourgaurds and Gatorskins are good as well. I don't think the problem is the tires. It was just not your month. If I had this bike for a while I would tend to agree with you. However I have only had it for 3 weeks and the last 2 weeks I got flats; Imo it is the tire. One thing I could do is dump some slime into the tubes...that has always worked on my Mt. Bike. I am leaning toward the Marathons also. The one advantage they have is the reflective sidewall which the others don't. I used to be a big Slime fan, but have since decided it is more mess than it's worth on high pressure tires. Just repair it and go on. There is no practical way to prevent flats if you live where there are goat head thorns. I've had excellent luck with the bontrager hard case. I think they're rated at 105psi. I've had one flat with them over a solid 2000 miles within Detroit proper. It was wet out, and a little piece of glass stuck to the tire and eventually worked itself in. Panaracer Pasela Tourguard are the best 27" X 1 1/4" clincher tyres I've ever found. +1. I haven't had a flat since using these on my commuter. OTOH, the ride from them is so harsh, sometimes you might as well be riding around on bare rims. But they are pretty indestructible if you are looking for reliability. No one has mentioned the Vittoria Zaffirros, a nice medium priced tire with Aramid fiber belts. I've never flatted on these. My experience with Panaracer Pasela Tourguard and Specialized Armadillos have both been good. For extra insurance I put thorn resistant tubes in also and haven't had a flat in 3 years on my bikes or my wife's. The Pasela does have a better ride, but the Armadillos have the kevlar in the sidewalls. They are hard riding and heavy, but for commuting I tolerate it to avoid flats. Getting to work late because of a flat is not tolerable. Also, it's too bad that there are no fatter tires made in 27". 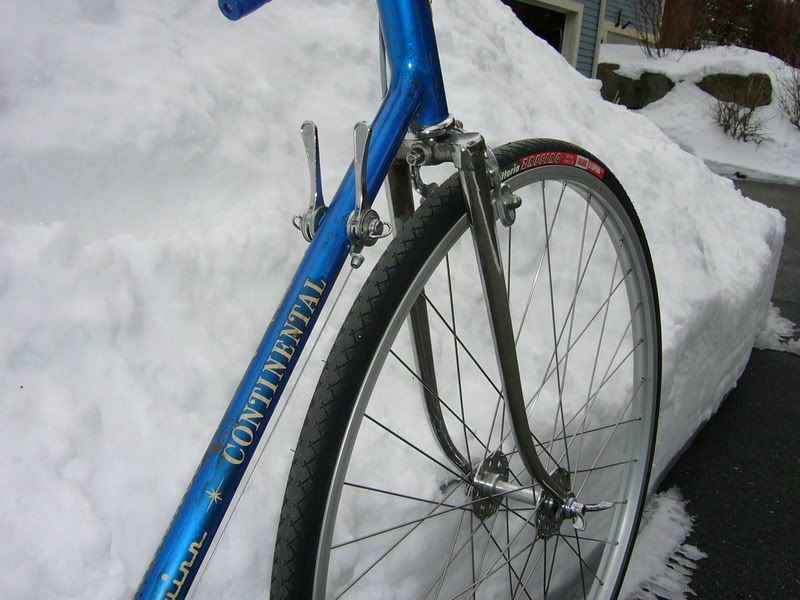 27"x1_3/8" tires are available, mostly for CX but there are less aggressive tread patterns out there for hybrids as well. Also, have you considered using a tire cleaner? You can make one out of a paperclip in about 15 seconds, even if it only knocks one thorn off your tire it was worth it. Bikes: 1983 Nishiki Cresta (original owner), 1987 Centurion Lemans RS, 1996 Gary Fisher X-Caliber, His and Hers Trek 800's, Schwinn beach cruiser woman's frame, and grandson's Huffy learner bike. When I lived in W. Texas, Slime was the only thing that helped with goat heads on my kids bikes, but I don't like it in high pressure tires. Even the thick tubes didn't help much. I have some Botranger 'Select K' 27 x 1-1/8 that I ride through glass almost every day. No flats. Results may ne be typical, but I really like them. and where you are ain't no good unless you can get away from it." Watch out on those Panaracers, they're taller than advertised and might not clear your brake bracket. Otherwise they're real tough and great quality. Yeah, fair comment - the Panaracer does seem to give a closer clearance than the Michelins they replaced. Not a problem on my bike but worth checking before buying. If you think the clearance for the Panaracer Pasela TGs might be an issue, they come in 1 & 1/8" width also. I have Contintental Ultra Sport 27 x 1 1/4" tires on one of my bikes and like them a lot. They have a wire bead, which work well on old straight-sided rims, and black sidewalls. I bought them at REI. just got these... hope they hold up! + a bunch Continentals. I put some on a 27" single-speed, and they're fast and able to take the pounding.